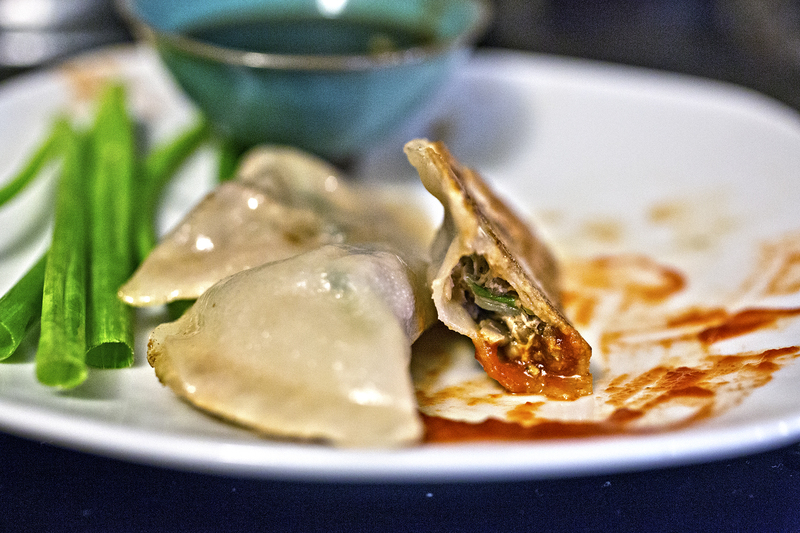 Asian dumplings are easier to make than you probably realize. Making a big batch and freezing some of them yields an 8 minute weeknight dinner or dinner party appetizer. Those look so delicious, I want to make them before reading your words. I. Love. Dumplings. Whenever we travel to Asia, or to any Asian restaurant really, I kind of can’t get enough of them. While making dumplings is kind of a long-ish affair (you have to individually fold and crease each one by hand), it goes quickly if you can snag a helping hand and they freeze really really well with minimal added cooking time from frozen. It helps to start with a little less filling until you get used to, and ideally somewhat good at, the folding and pinching process. I provided instructions for both steaming and pan frying the dumplings, in the style of gyoza. I prefer the steamed ones. If your rice cooker came with a steamer, you can steam them in that instead of over the stove, just make sure to line your steamer with something so they don’t stick. You can also boil them (Unleftover dumpling soup recipe is on the horizon…). I used a breakfast sausage mix because it is cut with pork, and pork and dumplings go together better than peanut better and bread. The seasonings here are really just a guideline; you can kind of throw in whatever you want. I’ll be doing a lemongrass/galangal next time myself. You can steam your dumplings in a wide pan with a vegetable basket or in the rice cooker! Now. Dumplings beg dipping sauce. You can use anything from a simple soy or store bought ponzu (which is what I did) or you can make your own. The recipe I basically stole (thanks Kenny!) includes a sauce recipe. Typically, you just take a little soy sauce and rice vinegar, and add flavors you like (garlic, chili, citrus; really whatever creams your coffee). Clearly, we couldn’t help ourselves during the photoing process. This recipe seems like it makes a lot, 70-80, depending on how many wrappers per pack. Trust me, it won’t seem like enough once you start steaming these babies. They disappear awfully fast. Combine all the ingredients except the dumpling wrappers, oil (if frying) and lettuce/cucumber slices (if steaming). Mix well with your clean hands, or with a large spoon. Set up a work area with ample space, a bowl of water, the dumpling wrappers, the bowl of filling, a plate (or cutting board, any surface for folding dumplings) and a parchment lined pan or two to place the folded dumplings on. Set out a few dumpling wrappers (about 5 at a time fit on my plate). 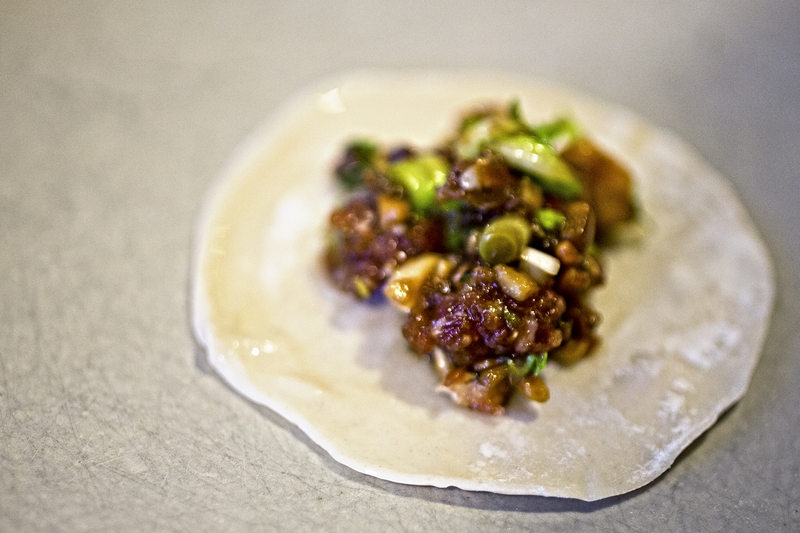 Dip your fingers in the water and lightly moisten the outer edge of the dumpling wrappers. Drop about a tablespoon of filling into each wrapper (hint: start with less until you get the hang of folding, then you can fill them with a little more). Fold the wrapper in half and press the edges together. Pleat if desired. Or, bring the edges up to form a little purse. You can freeze the tray at this point, making sure none of the dumplings touch. Once frozen, transfer the frozen dumplings to a ziplock or tupperware for later use. For steaming: Put about 1 cup of water in a large skillet, and lay a vegetable steamer in there. The skillet should be large enough for the steamer basket to lay nearly flat. Lay lettuce or cucumber slices on the steamer to prevent sticking. Position the dumplings on the steamer so they are not touching, bring the water to a boil, cover, and steam for about 6 minutes (fresh) or 8 minutes (frozen). For gyoza (pan-fried/potstickers): Heat the oil in a pan over medium high. Put the dumplings in a single layer and add about 1/2 cup water. Cover and cook until the water is absorbed. Non game substitution: Any ground meat will slip right into this recipe. Vegetarian substitution: You can very easily use more mushrooms and omit the meat, or come up with your own concoction of finely shredded veggies!